Californians for Justice was the defining moment for me where I realized that I could make a difference in my community. Before Californians for Justice, I was shy and quiet. I wasn’t sure that I had what it takes to be a leader. Leaders can stand up in front of a room and talk to 100 people. They are confident. They aren’t quiet. Through the Summer Youth Leadership Academy (SYLA) I realized that there are a lot of problems with our school system and that we have to work to fix them. After learning about the 2014 Student Voice Campaign, I became really excited about the implementation of student voice in school decision making processes because it allows students to have a say in their school. I was committed to creating a better school for all students. In 2015, I became a member of the Overfelt participatory budgeting steering committee. I played a pivotal role in making key decision for that process. Principal Chiala gave students $50,000 to decide through a democratic process what the money would be spent on. It was empowering to be given this type of decision making power. We decided to fund campus beautification efforts by planting flowers, painting student murals, and installing umbrellas on picnic tables. We believed that a beautiful campus is key to spark a positive feeling on campus and increase morale throughout the day. In addition to campus beautification, we also extended the driver’s education program. This was one of the top projects that emerged from student feedback. When I reflect on what I have accomplished in Californians for Justice in two years I feel proud. I am confident about my future. I know that all the public speaking and leadership skills that I have gained at Californians for Justice brings me closer to fulfilling my dream to become a defense attorney. Francisco is a sophomore at Overfelt high school in San Jose. 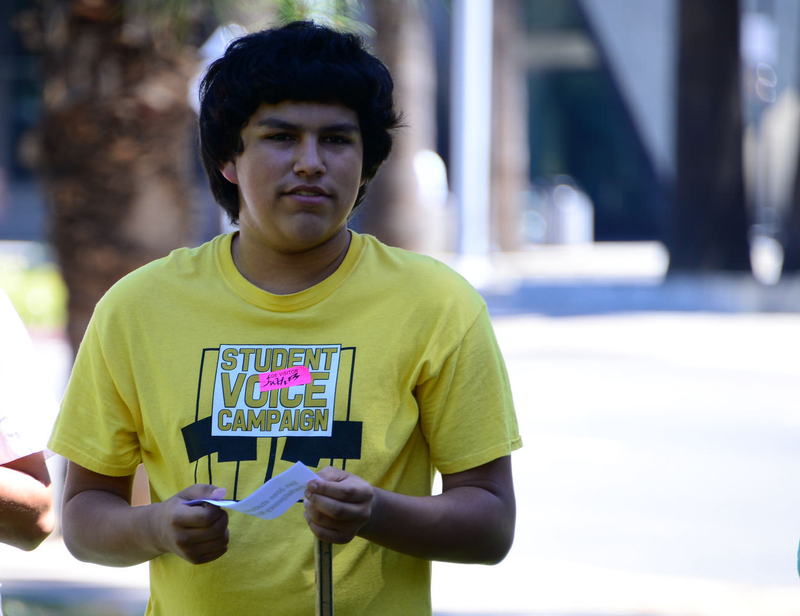 He has been a youth leader with Californians For Justice since his freshman year. Over the last 20 years, Californians for Justice has developed the leadership of thousands of young people in our communities. Let’s celebrate 20 years of developing the leaders together.